Som Tum is loved throughout SE Asia in various forms, and we are pleased to present this detailed summary so you can bring it to your own kitchen. Somtum is a classic Thai dish, commonly associated with the NE (Isaan) area but served all over Thailand including a sidewalk shop found on our walking tour of good eats in Saochingcha area. Somtum is typically prepared three different ways but here we feature the classics and some innovative variations. It can be "Somtum Thai" which has peanuts mixed in, "Somtum Poo" which has small rice field crabs pounded in, or "Somtum Lao sai pla ra" which includes the juice of pickled mudfish. Som tum is eaten as a snack as a salad. We also offer a very simple pre-made som tum sauce that you can add to the papaya, for quick preparation. 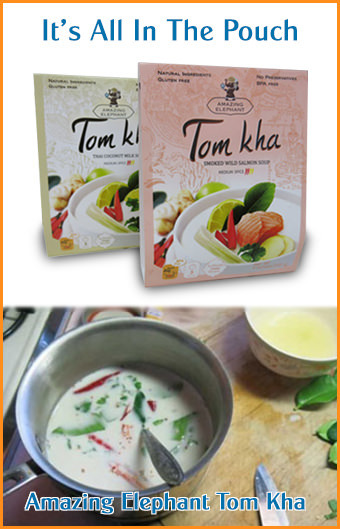 NEW: prepare it quickly with Som Tum Powder. 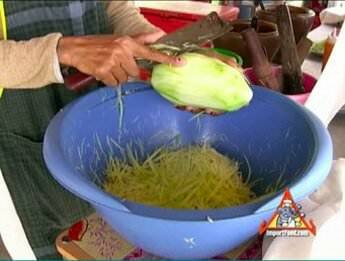 Peel fresh green papaya, rinse the white milk off, pat dry, then shred the whole papaya. Sprinkle with a bit of salt then rinse it off and drain. Keep 2 cups shredded papaya out, and put the rest in a sealed container for later use. Slice tomatoes thinly. 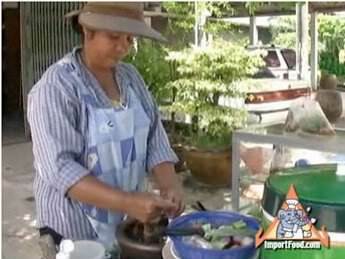 In a clay Lao-style mortar & pestle, coarsely pound the fresh chiles (whole) and garlic. Add string beans and sliced tomato, and pound it lightly (do not over-crush). Add dried shrimp, fish sauce, palm sugar and lime juice. Add these items spoon-by-spoon, and taste as you go. If you want to add peanuts, add now and lightly pound (optional). If you want to add pickled mud fish (pla ra), add two tablespoons of juice (optional). Add shredded papaya and pound together until mixed well. Serve on a dish with fresh cabbage and string beans on the side. Enjoy! You have to use Green Papaya, which is really really hard to find if you don't live in a tropical area. I have tried making som tam with a rutabega and it actually was a suitable substitute! Or, you can shred carrots and cabbage (but it's not quite the same). My girls use Cucumber if they cant get Papaya. Use the bigger fat ones. I didn't know that this national dish of Laos has become so popular in central Thailand.